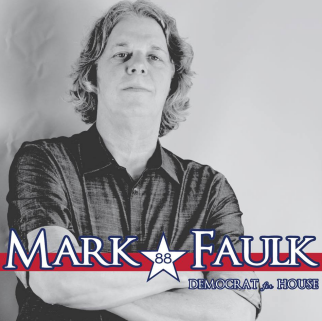 Filmmaker, author, and activist Mark Faulk will officially file for House District 88 on Friday morning, April 11th. As an activist, his candidacy will signal a shift in the dynamics of Oklahoma politics. Faulk is a fifth generation Oklahoman who graduated from Classen High School in District 88, co-founded the Paseo Festival in 1977, and recently filed an initiative petition to decriminalize marijuana in Oklahoma City. His book, The Naked Truth, Investing in the Stock Play of a Lifetime, led to criminal indictments in a major stock fraud case, and he was the writer and field director for the documentary The Wall Street Conspiracy. Faulk is currently co-producing a documentary about the Prison Industrial Complex, entitled Voices in a Jailhouse. His extremely detailed platform addresses over 25 different issues, and he is a strong supporter of ending the prohibition of marijuana, treatment over time for other nonviolent drug offenders, and ending Corporate Welfare by eliminating horizontal drilling tax breaks and paying a living wage to all workers. "We have starved our public educational system and allowed our infrastructure to deteriorate, while giving massive tax breaks to a handful of already filthy rich corporations. The hundreds of millions of dollars wasted on corporate giveaways would be much better spent supporting public education, rebuilding our crumbling infrastructure, and incentivizing locally owned, family businesses. As a lifetime Oklahoman, Faulk has witnessed the changes that corporate political cronyism has brought to the state in recent decades. “One of the things I have always loved about Oklahoma is our ability to accept each others differences, and in fact, to embrace that diversity. The people of Oklahoma truly are our greatest asset. But over the last few years, our image as a caring people has been badly tarnished and replaced by an ugly political culture based on greed, bigotry, and oppressive laws enacted by narrow-minded politicians. Faulk says that he would like to engage the other candidates in House District 88 in a series of debates over the next two and half months. He said that he intends to run his campaign from an activist’s perspective, showing people that actions are more important than generic campaign promises.